The clavinet is an electric/mechanical instrument that requires a keyboard amplifier to produce a usable sound level. Most models have 60 keys and a keyboard range of F1 to E6 (fundamental frequencies of 43.6 Hz – 1318.5 Hz). This five-octave span covers the range of an electric guitar and most of the range of a four-string electric bass guitar. The sound is produced by a harp of 60 tensioned steel strings oriented diagonally below the key surface. Each key of the simple keyboard action is a single lever element that pivots on a fulcrum point at the rear. A spring returns the key to the rest position. Beneath each key, a metal holder grips a small rubber pad. Depressing a key makes the pad perform what is known in guitar technique as a "hammer on" (forcefully fretting the string). An electro-magnetic pickup turns the string vibration into an electric current. The unique playing feel of a clavinet comes from this abrupt impact of the pad striking its anvil point against the string. The end of each string farthest from the pick-ups passes through a weave of yarn. When the key is released, the yarn damps the vibration of the string. Each string is tuned by a machine-head positioned along the front of the harp. This harp mechanism is completely different from the other Hohner electric piano keyboard products, the Cembalet and Pianet, which use the principle of plectra or sticky pads plucking metal reeds that do not require user tuning. Most clavinets have two sets of pickups, positioned above and below the strings. The clavinet has pickup selector switches, and a guitar-level output that connects to an amplifier. Early clavinet models featured single-coil pickups. The D6 introduced a six-core pickup design. Originally, Hohner intended the instrument for home use and early European classical and folk music. The clavinet L, introduced in 1968 was a domestic model with a wood-veneered triangular body and wooden legs. It had reverse-colour keys and an acrylic glass music stand. The final E7 and Clavinet Duo models reflected the culmination of several engineering improvements to make the instrument more suitable for live amplified rock music, where it had become a popular instrument. The Clavinet Duo model combined a clavinet with the Hohner Pianet T in one compact (albeit heavy) instrument. After Hohner stopped producing the Clavinet E7 and Clavinet Duo, they used the brand name for electronic and digital keyboards with no electro-mechanical sound production features. In the late 1980s, they applied the "Clavinet DP" name to a range of Japanese-made digital pianos. These instruments were designed for the home market, and made no attempt to emulate the electro-mechanical clavinet. In 2000, Hohner disassociated themselves from the clavinet completely by transferring their spare-parts inventory to the restoration website Clavinet.com. The unique sound of the clavinet lives on in patches and voices built into contemporary digital keyboards. It is one of a handful of vintage keyboard sounds considered so distinctive that most major electronic keyboard makers include emulations of it. As digital keyboard technology has advanced, the quality of clavinet emulations has improved. It is now common to find clavinet emulations that model both the original sound of a clavinet and the sound they made when the rubber pads decayed and began to stick to the strings. During the production life of the clavinet, mechanical features and electronics changed to keep pace with developments in electronics manufacture, reductions in manufacturing costs, and fashion. The clavinet also evolved in response to the needs of musicians playing rock music in amplified bands. The Clavinet I is housed in a bulky timber veneer box with a rectangular case profile. It has a bronze-gold hammertone painted aluminium fascia panel below the keys with the word 'Clavinet I' in black at the left hand end. There are box ends at either end of the case with controls on the top surface. The 60 note keyboard sits recessed between these, under a folding lid. The keys are injection moulded plastic attached to metal frames. A white speaker grill faces upward on the left box end. Tapered rectangular cross-section legs mount to the ends of the case, secured by four threaded knobs. The legs are wood grain to match the case, and braced by a gold cross bar towards the base of the rear legs. A bent rod music stand pegs into two holes on the upper surface. Same general description as the Clavinet I except the bronze-gold hammertone painted aluminium fascia panel below the keys has the word 'Clavinet II' in black at the left. There is no internal amplifier or speaker grill on the left. The Clavinet C has a slimmer case than the I or II, and is finished in red vinyl material. A removable black aluminium panel below the keys provides access to the tuning machines. The words 'Hohner Clavinet C' are screen printed on the right hand end. The upper surface of the keyboard is finished in white, and a slot holds an acrylic panel music rest. The music rest has the Hohner logo printed onto the lower left corner. Four black tapered tubular steel legs are threaded into mounts on the underside of the case. The legs fit into a box section under the top surface for transport. A removable transport lid fastens over the keyboard and controls. The Clavinet L, introduced in 1968 was a domestic model and featured a wood-veneered triangular body with three wooden legs, reverse-colour keys and an acrylic glass music stand. The Clavinet D6 continued the case style of the C but is covered in black vinyl leathercloth and the upper surface of the instrument is satin timber veneer. The transport lid is finished in light grey vinyl leathercloth and has three latches and three handles. The Clavinet D6, the most popular model, introduced in 1971. A number of D6 labeled instruments were made in the E7 style case and include D6 logos on the control panel and the removable tuning cover. The E7 has a black vinyl leathercloth covered case with a rectangular profile with rounded corners and a removable lid to protect the keys and control surface for transport. The control panels at the left hand end of the instrument include the D6 Clavinet mixture controls and a sliding control for the volume. This hybrid model uses a black case in the style of a Clavinet E7. The Duo has a rectangular case profile with rounded corners and a removable lid to protect the keys and control surface. 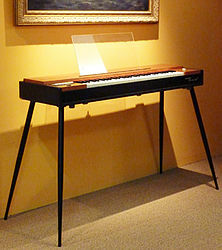 Some examples have both versions of the name: Pianet Clavinet Duo and Clavinet Pianet Duo. The controls at the left the instrument include keyboard splits and mixtures of the two instruments, as well as normal Clavinet mixture controls. In the 1980s and 1990s replacement parts for clavinets became harder to find, as Hohner had ceased to support them. In 2000, Hohner USA relocated to a new facility and sold remaining spare parts inventory to Clavinet.com. The principal clavinet restoration issues are hammer tips and strings. The original hammer tips were made of a polymer compound that decomposes with age, so they became sticky and ultimately liquefied into a paste. Hohner intended that the tips be a service replaceable item, as in normal use they develop grooves and occasionally split. Restorers and players who wanted to keep a clavinet working had to fashion their own tips from rubber or polymer extrusions. Clavinet.com manufactured the first aftermarket molded replacement hammer tip set in 1999, leading to an increase in the number of working clavinets and renewing interest in the instrument . Clavinet strings, while similar in gauge and style to guitar strings, are longer, making readily available substitutes a problem. Clavinet.com manufactured the first aftermarket clavinet string set in 2000, and remained the only replacement string supplier for the entire decade—bringing more previously unusable clavinets back into service. In the 2000s, a number of businesses have begun to service and maintain vintage keyboards, and replacement parts for the clavinet are now available from multiple suppliers. When the clavinet was used in funk, soul, rock and jazz fusion in the 1970s, it was often plugged into electronic effects units (mostly Phaser and Wah-wah) and then into an instrument amplifier. Electronic effects added a unique sound to the clavinet. 2010-era music that draws on the sound of this era often uses similar effects with the clavinet. ^ a b "Hohner Clavinet". Emusician.com. Retrieved 19 October 2018. Wikimedia Commons has media related to Clavinets. Manufacturers replacement parts for Clavinets.